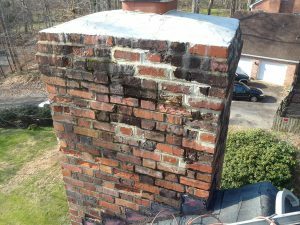 Leaking chimneys may need to be waterproofed in addition to re-pointing failed and or deteriorated mortar joints on the exterior of the chimney. Sometimes re-pointing alone does not solve the water entry problem, the masonry and brickwork can absorb water like a sponge. To test for this we are able to perform a Masonry Absorption Test (MAT) by measuring the rate of absorption. Efflorescence stains or whiting on the exterior of masonry is another problem caused by water penetration. Some areas of concern with water entry include water stains on the ceiling and walls, rusted fireplace accessories and glass doors, deteriorated masonry or metal firebox assemblies, deteriorated exterior mortar, chimney settlement and more. 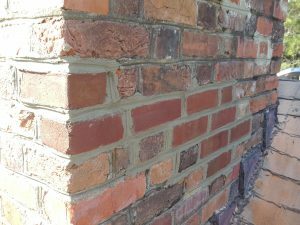 Re-pointing also known as tuck-pointing is a method of replacing cracked, failed, or deteriorated mortar joints between brickwork. The joint is cut out using either grinder or chisels to an appropriate depth; the joint is packed with fresh mortar and struck with a similar style striking tool. Re-pointing your chimney will give it a longer life and enhance its appearance. A large amount of the masonry found in our service area is portland based mortar. We do see lime-based mortar as well. 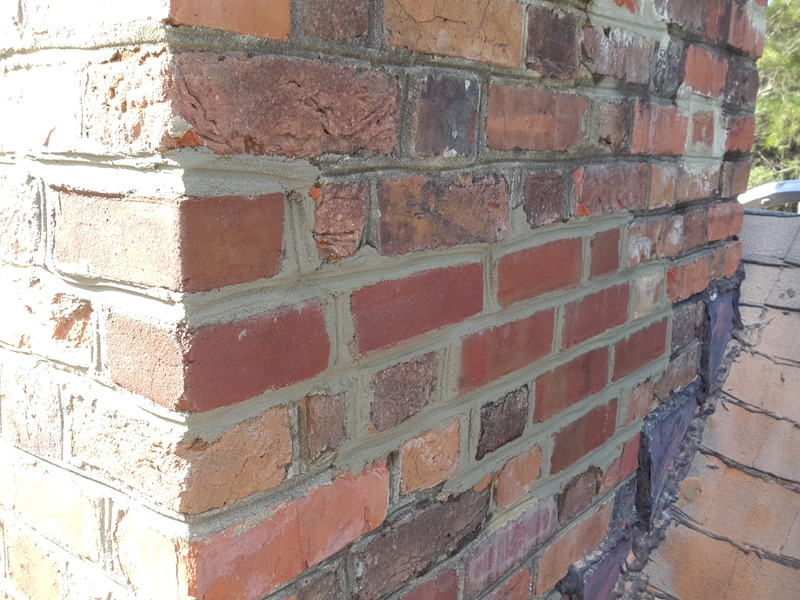 Lime-based mortar can also be re-pointed, but using a different method. For more information on re-pointing lime-based mortar please visit our historic restorations page. This is a common issue that can plague any type of brickwork from masonry chimneys to retaining walls and more. It is easily noticeable when small cracks begin to lead to bigger cracks as the brick surface deteriorates. 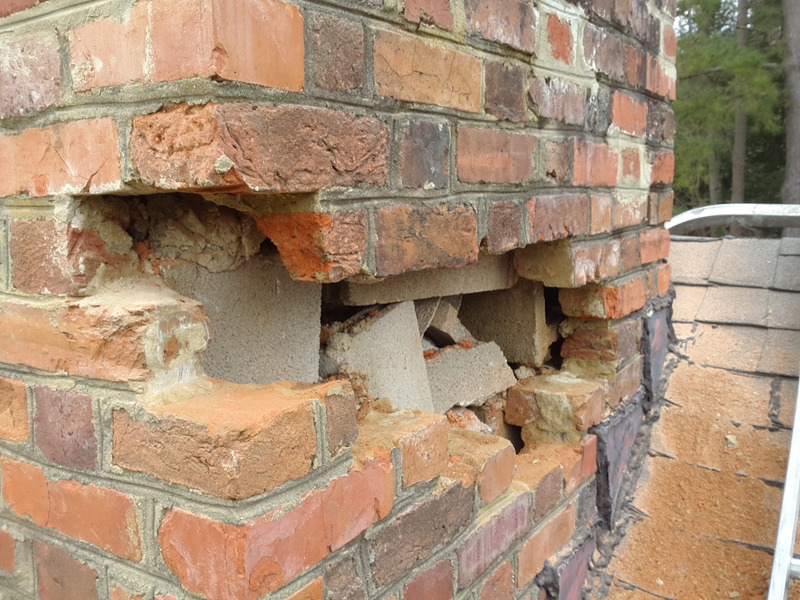 This can happen in brick that isn’t properly treated or installed, or over time as brick ages naturally. Bricks of lighter color will often absorb more moisture, and will be affected by spalling more readily than darker counterparts. This often occurs when indoor bricks are used instead of outdoor ones. Indoor bricks are not as weather resistant as their outdoor counterparts and absorb moisture more readily. Constant absorption, freezing, and thawing within the brick caused cracking and deterioration. The only fix is to remove damaged bricks and replace them with proper outdoor rated materials. 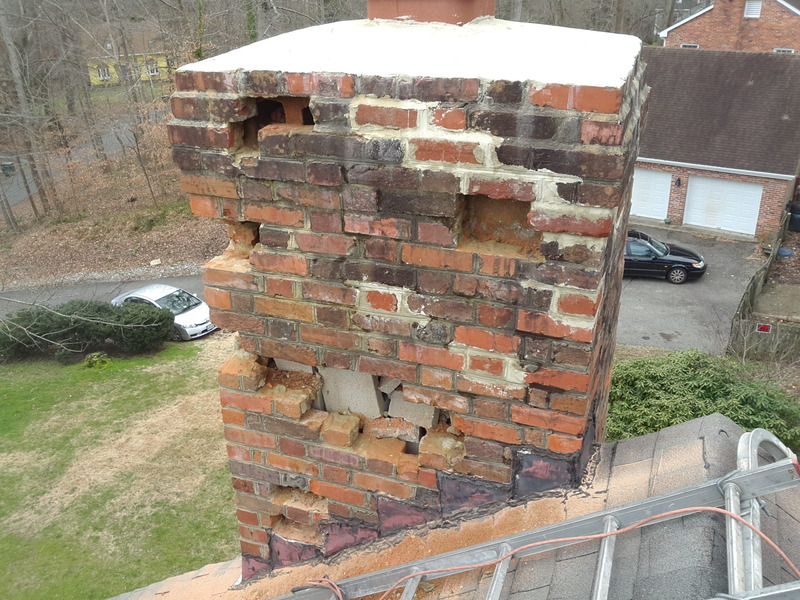 This was the chimney as we found it. Many bricks were removed due to spalling. And replaced with new brick rated for outdoor use. 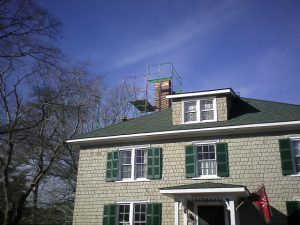 Black Goose Chimney is certified in various aspects of chimney inspection, sweeping, and repair. You can trust our work and use your fireplace or wood stove with peace of mind when we leave. If you need chimney repair services, call (757) 596-2298.